Are you hesitant to declutter because you think the things you need to get rid of might be worth something? While it’s almost always easier (and more efficient) to give things away or donate them, selling items in a resale always motivates me to declutter. If you must sell your things (rather than donate), I highly recommend participating in a children’s resale. When my kids “graduated” from bouncy seats, swings, and play pens, I made more than $1000 by selling at a moms of multiples resale (I have twins, so I had double the stuff!). Almost every time I’ve sold items in a resale, I’ve made more money than I would have at a garage sale. On average, I usually make around $200. Even though resales can be more profitable, they also take a lot of work up front to get all of your items ready to sell. Good crowds. If a resale is crowded, that means there are lots of buyers. I try to look for sales where people are lined up outside the door, and people are vying for a chance to buy things as quickly as possible. Look for a Filene’s wedding dress sale-type atmosphere. Items like your own. Look at what other people are selling. Do you have similar things you could sell? How are people pricing the items? What is required of participants? Are you obligated to work at the sale or volunteer? What type of work will you need to do to get your items ready? Consider what type of arrangements you’ll need to make for childcare. If you’re required to be at the sale, and you have to hire a babysitter, that could eat up a lot of your profits! What supplies will you need? Will you have to buy anything to put price tags on your items? Do you need to use a specific type of hanger for clothing? Will you need to buy new batteries for some of your toys? Will these expenses be worth it? How much can you expect to earn? If you can, ask other sellers or coordinators about average seller earnings from each sale. Do you have to pay to participate? Will the sale coordinators take a portion of your earnings to pay for the facilities, advertising, and other expenses associated with the sale? You’ll also want to think about the time that it will take you to prepare for your sale. Tagging, cleaning, and hanging items is very time consuming. If you’re prepared, and can work at it over the course of several weeks (or months) before the sale, you’ll feel much less overwhelmed. Learn about the rules and specifications for your sale. Be sure you totally understand what’s required of you, and what supplies you’ll need to purchase to prep for the sale. Also, pay close attention to what types of items your sale will accept. Buy the supplies you’ll need in advance. Many sales require that you print your price tags on cardstock, use a tagging gun, or attach your price tags with safety pins. Collect hangers. Ask your friends and local businesses to give you their old children’s hangers from stores like Carter’s, Old Navy, and Target. If you’re desperate, you can also buy cheap plastic hangers from Amazon. Go through all of your children’s clothings, toys, books, etc. 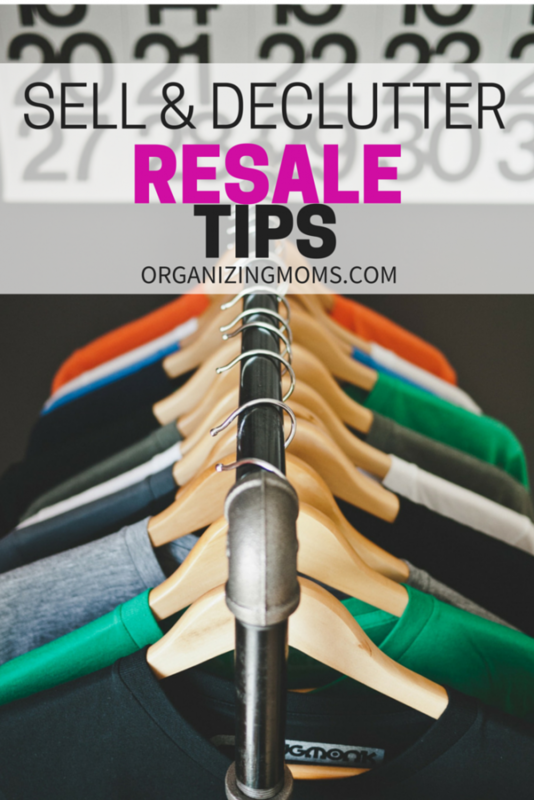 Anything that’s too small, not being used, or not useful to you could be sold in the resale. Designate a holding area for items to be sold. As you find things that would be suitable for the resale, you can bring them to the holding area. Store clothing to sell by size and gender. I like to make a box for each size to simplify tagging and putting items on the racks at the resale. Start tagging items as early as you can. Some resales require that you use their price tag printing system to make your tags. Find out when you have access to it, and start printing off price tags for your items. If needed, make arrangements to get your stuff to the sale. 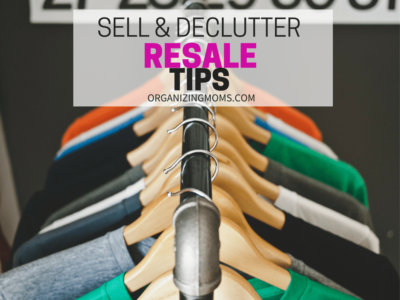 Most resale setups aren’t kid friendly (they’re kind of stressful and a little bit dangerous, to be truthful!). You might need to coordinate for childcare with a friend, or get a babysitter. If you’re required to work at the sale, clear your schedule for the night after the resale. You’ll be exhausted! If you’re required to do a job a the sale or volunteer your time prior to the sale, sign up for a job as soon as possible. That way you’ll have more opportunities to choose from. One of the best things about selling at a resale is that it gives you a deadline. In order to make the most of each sale, you have to have your items ready to go, and out of the house by a certain date. Although it requires a lot of work, it’s a great way to declutter! Want more decluttering tips delivered to your inbox? Sign up for the Organizing Moms newsletter!